This review started its life as a look at the sequel, KOTOR II: The Sith Lords. In the process of examining that game, I needed to “refresh my memory” on the first, which somehow resulted in me playing through this entire game again. This was my first Bioware game though, so it turned out to be quite pleasant to return to after all these years – and in light of what the studio has done in the time since. It’s this game that established Bioware as masters of the modern Western RPG, which they would further cement with Mass Effect (recently dissected on FFG), and leverage into their most recent Old Republic MMORPG. KOTOR was released as an exclusive feather in the original Xbox’s cap, and made its way over the neutral territory of the PC four months later. The Old Republic series’ marquee point is that it takes place 4,000 years prior to the movies, and thus explores some of the legends behind the Jedi, Sith, and the Galactic Republic. This particular episode revolves around the emergence of the Sith as an invading empire, marshaled by fallen Jedi duo Revan and Malak. At the start of the game, the Jedi have managed to dispatch Revan, but his apprentice Malak has taken charge. He scours the galaxy looking for a powerful young Jedi – Bastila Shan – who spearheaded the ambush of his former master. You play as a male or female soldier on board Bastila’s crippled vessel as Malak attacks. Character creation is noticeably light compared to modern RPGs, with only a handful of premade faces and three fairly similar classes to choose from. Through a heavily tutorialized run through the ship, you’ll learn the basics of movement and game controls. After escaping to the planet below, you’ll begin your adventure proper – one that spans seven worlds, introduces nine members into your party, and sees you eventually trained as a fledgeling Jedi on a mission to save the galaxy. Worlds are realized in full 3D, and you’re free to explore them in a third person view with limited camera controls. As this originated on consoles, worlds are broken up into smaller, memory-friendly districts (expect loading times). These districts feature shops, side missions, entrances to “dungeons,” and hosts of gregarious locals to interact with. You can have a maximum of two other party members following you around at once, and you’ll always control one of them while the others automatically follow in tow. The only downside is a lack of a fast travel system (you can only return to base), so you’ll have to jog back and forth across worlds, loading screens and all. World objects you can interact with are highlighted and labeled, and you have the extra option to tap keys to cycle through everything useable in range (a helpful holdover from its console origins). You’re not likely to miss anything as a result, but it also means you won’t be scouring the environment and looking for secrets. This gives a bit of a “hands off” feel to the worlds, much like an amusement park ride – they’re pretty, but shallow facades. This extends to the conversation system as well. You initiate fully-voiced conversations by “activating” named NPCs, and a multiple choice system lets you pick topics to inquire about. Your options usually vary in tone between helpful and smarmy, but throwing attitude around rarely has a lasting effect, and most choices lead to the same result anyway. Stuns and holds are pretty effective at organizing combat, and your opponents certainly won’t hesitate to use them. Combat runs in real time, but a lengthy set of pauses between actions means it doesn’t stray too far from its turn-based roots. Here again, you’re directly controlling one party member while the AI handles the rest. However, you’re able to freeze time without restriction by tapping the space bar. Here, you can switch to other members and queue up actions. The default attack sends that character charging forward and automatically dealing basic damage. Meanwhile, a window floating above each enemy lets you click to queue powers and items. When you’re ready, a smack of the space bar unfreezes time and plays out the battle. Should someone fall, they are automatically resurrected once all enemies are cleared. Powers basically consist of stronger attacks with a temporary penalty to defense. You can also specialize in certain weapons or styles (e.g. two-handed attacks) and so have characters especially suited to particular roles or scenarios (healing, crowd control, etc). Useable combat items include health kits, antidote kits, and stimulants that boost stats for a short time. You can also throw grenades with various effects, but these don’t appear to level their damage with you, quickly making them obsolete. Stimulants are equally unnecessary, except at the hardest difficulties; where you’ll also need to freeze time extensively to coordinate attacks between party members and squeak out any advantage you can. It’s also worth noting that health does not regenerate on any difficulty level, so a hearty stock of health kits or healing Force powers are mandatory. All underlying mechanics follow the Dungeons and Dragons d20 ruleset. This can be efficiently summarized as “invisible die rolls for everything.” There’s a random element to every attack (with a roll of 20 considered a “critical hit”) and your goal is to mitigate this randomness through your equipment – various gear, stats, and character perks add bonuses to rolls or increase the range of what counts as a crit. Meanwhile, every attack is compared against an opponent’s rolls for defense, plus bonuses on both sides for gear, and, well, let’s just say you’ll be glad all this work takes place behind the scenes. In practice the system is never terribly complicated, and while floating damage numbers are shown, the numbers really never go deeper than “higher is better.” A casual player will still always clearly see what gear or stat choices are beneficial, even if they don’t understand the mechanics behind them. The Star Wars elements come in through the technology. Your weapons are blasters and lightsabers. You’ll earn your own spaceship to act as a home base. Computers can be hacked (“sliced”) and stealth generators let characters attempt to slip past troublesome foes. As additional Force powers get introduced (for both you and certain companions), you’ll see them clearly split into Light and Dark powers. Dialog choices and actions within the game world swing your affiliation closer to either good or evil, and similarly-aligned powers will then take less energy to use. Light side powers are strictly defensive, with barriers, heals, and timed stat boosts for your party. Succumb to the lure of the Dark Side, and you’ll choke insufferable fools with your mind, shoot lightning from your fingers, and watch your character’s face actively distort as they become more corrupted. Dialog attitudes are mostly for your benefit. You don’t really earn a reputation for being a saint or a jerk. A final consideration goes to your stats and skills. Completing missions and defeating foes grants XP, enough XP grants a new level. Here you’ll allocate points to things like physical strength, health, or charisma. Each level also gives a separate pool of points to skills like persuasion, computer hacking, or repair. These skills are used within the world, and true to games like Deus Ex, different paths to the same objective are opened by different skills. A hacker could slice a computer and vent gas into a room full of foes. A master of repair could reactivate a droid and send him with similar results. You also don’t need to handle everything yourself. You can specialize the skills of party members as well, and switch to them when their expertise is needed. Their stats are then used for calculation instead of yours, and limited skill points overall encourage you to have dedicated hackers, mine disarmers, and engineers. Writing it all out, it sounds complicated. In practice, it isn’t. You’re growing your party over the course of the game, and all these decisions will come piecemeal with plenty of time to consider how you want to allocate. It also highlights how rich the game is. While the areas are small, and there is a tremendous amount of backtracking, there’s also a surprising amount of content packed into each district. Side missions are plentiful, and not all of them are simple “find this item” tasks. Highlights include participating in arena combat, solving a murder, taking bounties, joining a secret assassin’s guild, and defending a man in an alien court. There’s a racing minigame you can play on many worlds for cash and fame. There’s also a hybrid of collectable card games and blackjack called Pazaak. You can earn or purchase better cards for your deck, and play games to earn yet more coin and notoriety. Overall, the story is well-told and feels tight. There’s certainly the feeling of a grand adventure here, and you can expect to sink about 30-40 hours into a single playthrough. The comparatively linear beginning act is the only part that drags, and to be fair, this is from the perspective of a second run. The middle act gives you the freedom to travel to four planets at will, while simultaneously keeping clear what needs to be done (a helpful quest log assists as well). Each planet is diverse, both visually and tonally, and all about equally interesting. The art style and overall feel ties into the Star Wars franchise well, particularly the original trilogy. There apparently hasn’t been much technological progress in 4,000 years, but there’s nothing wildly advanced from the later films in this prequel either. KOTOR has some of the most ridiculous helmets (and you can’t hide them), but their benefits almost make up for it. Characterization also gets high marks, and is a point of Bioware pride. The members of your party come with their own perspectives and baggage, and chatting with them between missions opens up backstories and interesting side quests. These conversations also help define your character from a somewhat blank slate, into either the savior or destroyer of the galaxy. I’m reluctant to speak about the famous plot twist, because it actually managed to trick me the first time I played. It seems woefully transparent and overly convenient now, so its success may have been a product of its time (I actually think The Matrix, of all things, helped the twist’s credibility). Even still, it’s an enjoyable yarn, and the added variety of side quests and companions to befriend keeps you solidly engaged. As for flaws, I think the biggest one is a question of replay. With only two companions out at a time, you absolutely will miss some interactions. Some of them are even quite good, but I’m not sure it’s worth replaying an entire game for considering little else changes. Plotwise, you’ll get steered to the same situations regardless of your dark or light affiliation, and your companions are awfully dismissive to allow this to happen. You may get some “we’ve noticed you’re giving in to your anger” talks, but no one ever calls you out on wearing all black and frying foes with mind lightning. Again, it’s a pretty linear tale with few chances to really derail it. Likewise, this is pretty clearly designed as a Light Side story. Dark Side choices aren’t all punching kittens and growling through every conversation, but for game balance considerations, it’s hardly the “quick and easy” path either. Mostly you’ll just see a handful of additional cash, and rarely will you skip over extra steps and go right to the reward (by just killing someone and taking it, for example). And plotwise, the fruits of your dark labor won’t appear until the very, very end. Oh, they’re quite delicious, but you’ll have to endure 30 hours of Carth being an insufferable whiner before you get there. No, you can’t throw him, or anyone, off the boat. One final, minor complaint is with the structure of being a soldier turned Jedi. Skills that support early soldier gameplay (blasters and armor) have no use as a Jedi. For example, you can spend points on dexterity for blaster accuracy that becomes useless with lightsabers (they use strength). If you’re worried about maximizing your Jedi potential, then use vibroblades in the early game. These are essentially low-end lightsabers that make use of the same stats, skills, and attacks. Alternatively, the “lost” points really don’t matter at the lower difficulties, or your could try to continue using blasters alongside your new force powers. You can’t use Force powers while wearing armor though, making this a pretty ineffective setup. It hasn’t been rebuilt for the PC, but it’s still a pretty game. Graphically, it still holds up surprisingly well. Lighting is excellent, and special care has been given to impressive spark and glow effects. There’s no bump mapping or advanced texture work beyond some shiny light reflections, though grass will sway, faces animate basic expressions, and the sword/saber battle animations are particularly theatrical. It’s also worth noting that there’s no real improvements on the PC other than support for higher resolutions, but the impressive effects from the Xbox have been maintained. Music and effects are Star Wars through and through – nothing to say there. Voices are cast well and performances are solid. This is definitely one to turn the subtitles off for. The only complaint here comes from a handful of alien language clips that get reused incessantly, but this becomes easy enough to ignore with time. Aside from higher resolutions and anti-aliasing, the PC features a redesigned interface for mouse and keyboard. Navigating is easy enough, and clicking makes menus much quicker to peruse, though clicking on items within the world can be a little ropey. Unfortunately, the PC removes all support for gamepads, and the interface is redesigned in a way to nullify a mapping program like Xpadder. The Xbox’s control scheme was extremely intuitive, so it’s a shame you won’t be able to enjoy the PC version from the couch. There’s also one addition to this version – a new location around Yavin, where you’ll take part in a short quest series that gets updated across the length of Act 2. Completing the steps in this series increases the quality of exclusive goods available to buy at Yavin, which are far and away the best in the game (almost absurdly so). Of course, if you have no affinity for Star Wars, this one becomes hard to recommend. There is an absurd level of detail and backstory you can go into, but I have the feeling that the Old Republic’s version of things like the creation of the galactic races aren’t going to carry over beyond the Expanded Universe. If you’re not averse to some Jedi mysticism and spirited planet hopping, then this is easily one of the finest Star Wars games, and also one of the best modern Western RPGs. A gripping story, a fun (and scalable) combat system, and plenty of diverse locations and tasks make this one absolutely worth checking out for fans of the genre. Strong story. Combat is simple enough to control, and can be as difficult as you want it to be. Excellent camaraderie with your party members. Lots of variety in locations and side missions. Some flexibility in becoming a Light or Dark Jedi. Replays just highlight how linear the story really is. You get powerful attacks in combat, but can’t have much “fun” with the citizens as a Dark Jedi. Carth can’t be punched, killed, or punch-killed. good review but can you explain the matrix part? Without getting too spoilery, I think the idea of an undiscovered hero powerful enough to change the course of the galaxy was easier to take at face value when The Matrix was still fresh in the cultural mind. 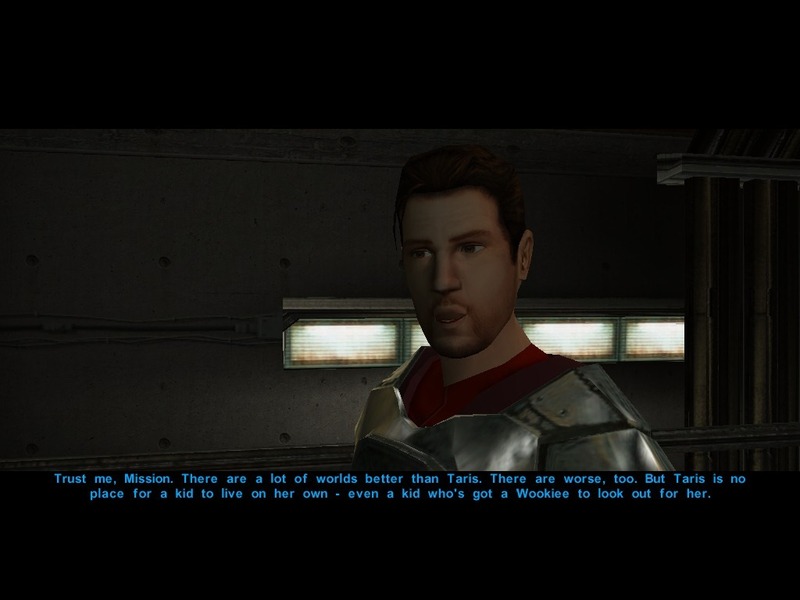 Neo was a familiar story, and KOTOR seemed to play on that expectation a bit.